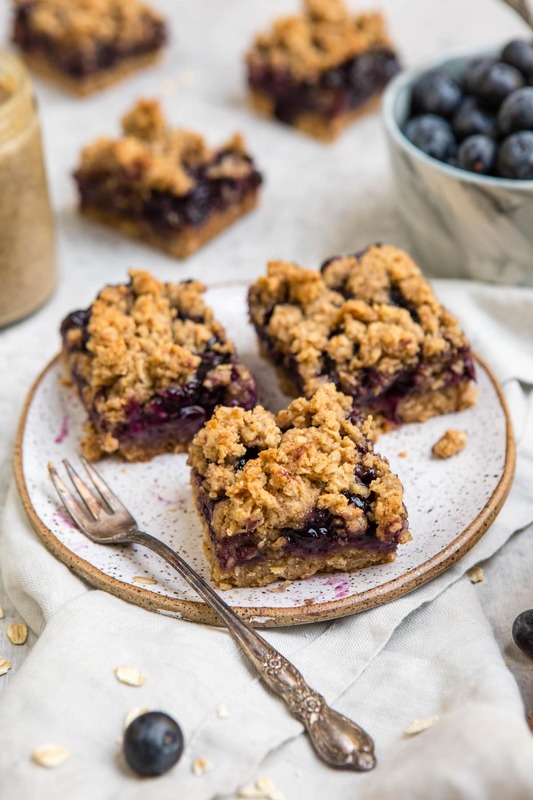 These Blueberry Crumble bars are Vegan, Gluten-Free, and Oil-Free, and made with only 9 healthy ingredients! A tasty, delicious, and easy-to-make dessert. 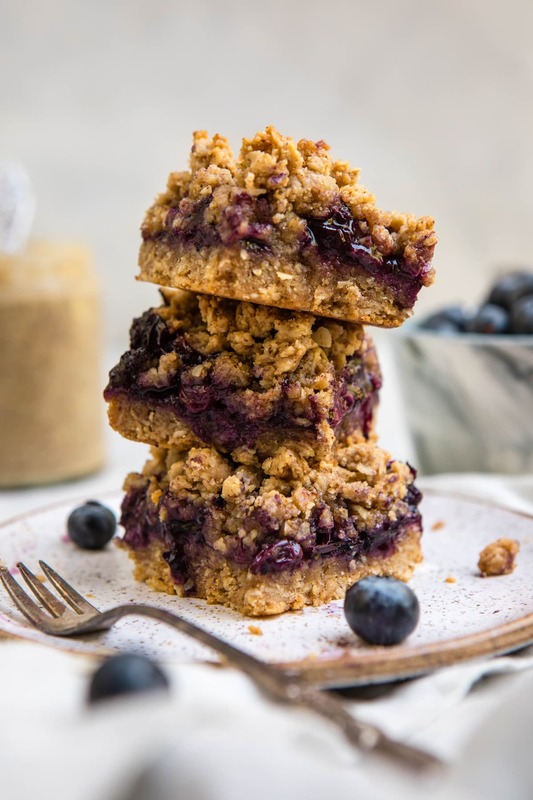 A thick doughy base, gobs of sticky & sweet blueberries, and a crispy crumb topping. 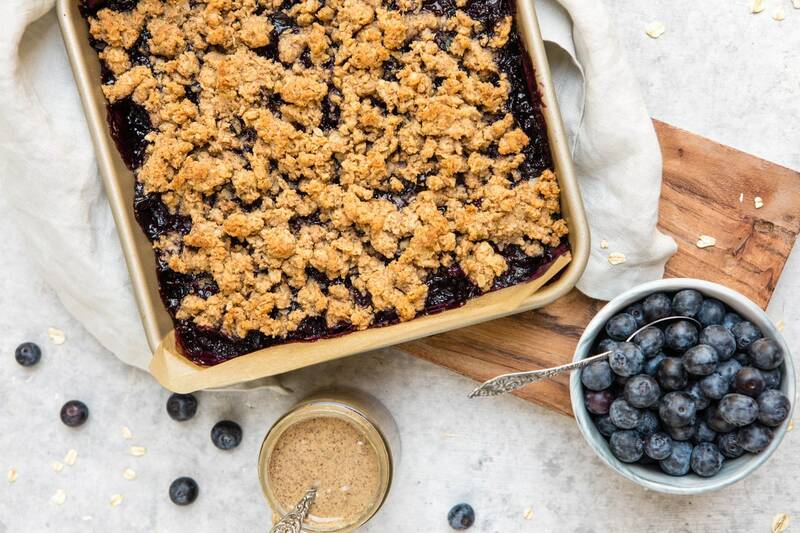 What’s not to love about Blueberry Crumble Bars? Oh yeah, the whole they’re-usually-filled-with-dairy-eggs-and-gluten part. Fear not, friends! 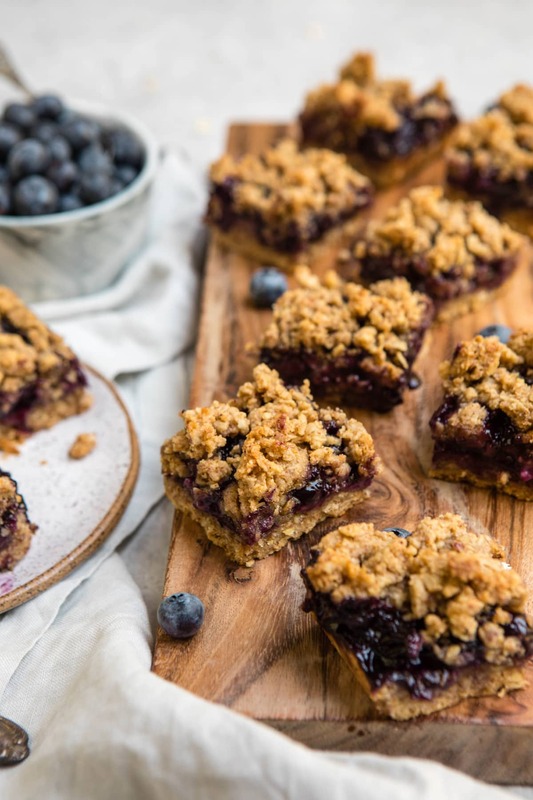 These Crumble Bars are Vegan, Gluten-Free, Oil-Free, and they’re Refined Sugar-Free too. I even have a Nut-Free substitute in the recipe notes, so pretty much anyone can eat them. 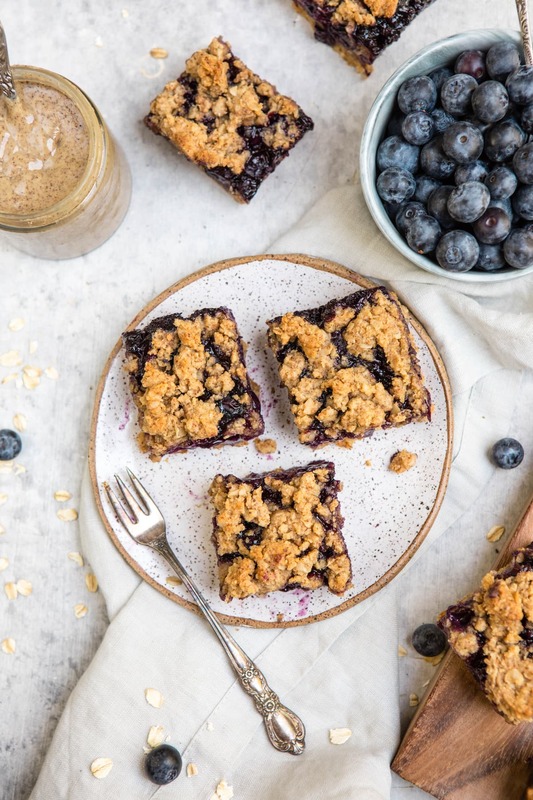 Made with only 9 plant-based ingredients, these Blueberry Crumble Bars are almost as good for ya as they are delicious! Can we also just take a moment to appreciate how cool Crumble Bars are? I seriously love how the same dough serves as both the base and the crumb topping. Is that the multitasker in me speaking? Probably. Do I care? Nope. I would strongly recommend letting the bars cool before you cut them, as they need some time after baking to set. However, you could easily reheat them in the oven or a toaster oven if you’d like to serve them warm! I used a Natural Almond Butter made of only Almonds; if your Nut Butter is salted, reduce the amount of Salt to ¼ tsp. If you’re looking for more fruity Vegan Dessert recipes, you’ll also love this Vegan Blueberry Pie and these Sugar-Free Strawberry Cheesecakes! First, prepare the Blueberry Filling. Add all ingredients to a medium pot and bring to a boil over high heat. Reduce the heat to medium and simmer for 3-5 minutes, stirring the mixture frequently to ensure nothing burns or sticks to the pan. The filling is “done” once it has thickened and most of the blueberries have popped. Set aside to cool. Next, add the Almond Flour, Tapioca Flour, Oats, Baking Powder, and Salt to a large bowl. Whisk until evenly incorporated. 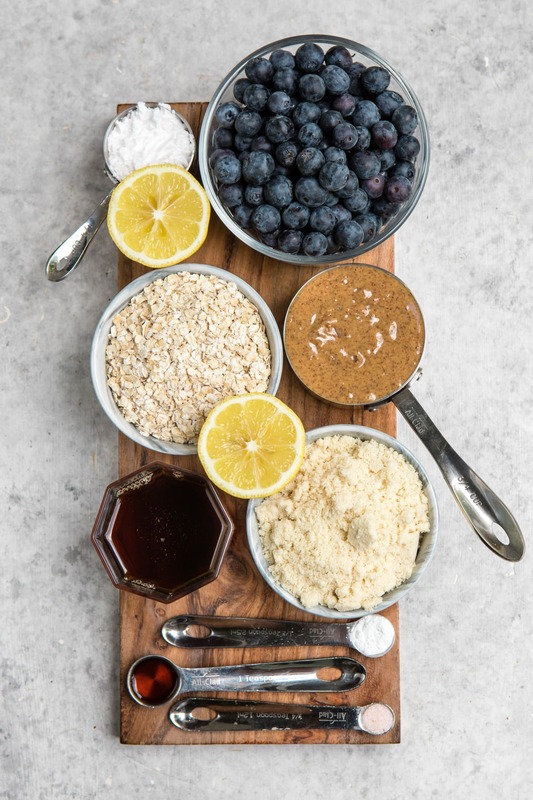 Stir the Almond Butter and Maple Syrup together in a small bowl until they form an even paste, then add this mixture to the dry ingredients. Stir well until no dry clumps are left – the mixture should be pretty thick! Grease or line an 8×8” pan and press half of the “dough” into the bottom of it. Pour the Blueberry Filling over this layer, then use your hands to crumble the remaining dough and sprinkle it over the top. Bake for 27-30 minutes, or until the Crumb Topping is crisp and slightly browned. Let cool before slicing in the pan, then serve as desired. Leftovers will last at room temperature for up to 4 days, in the fridge for about a week, and frozen for about a month. To make this recipe Nut-Free, substitute the Almond Butter for Tahini, Sunflower Seed Butter, or melted Coconut Butter. This recipe should also work with Frozen Blueberries! 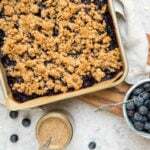 You may have to simmer the Blueberry Filling for a little longer, as Frozen Blueberries usually release more liquid. Downstairs Home Reveal + What Makes a House a Home? These look amazing🤤 quick question, would I be able substitute the almond flour for All Purpose Flour if I’m not gluten free? Hi Theresa! I imagine that AP flour would work, but I have not tested it in this recipe. Each flour absorbs a different amount of liquid, so I would start with half of the amount of the Almond Flour at first, and then increase until the dough is thick and moist, but not too wet. just made them but i used a frozen berry mix and it was amazing !!! This recipe looks good! I’ll have to try it after i get moved in to my new apartment later this month! I need a new mixer I thought I saw one that you used in one of your videos, or am I mistaken? What kind of mixer is it? Girl, I love each and every dang one of your recipes. I hype you up to all of my vegan buddies! Is it possible to sub arrowroot for the tapioca flour? Is that a thing? Hi Kelley! 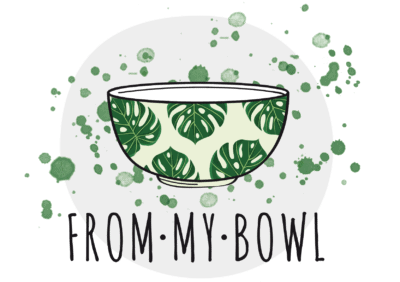 Thank you 🙂 I believe Arrowroot is a good sub for Tapioca Flour in most cases – it should probably work for these as well, though I have not tested it! I made these with peaches because we have so many right now and they were bangin’!! Thank you for another great recipe. hehe yes, that is totally allowed! This was so tasty! I used peanut buttet and frozen blueberries and raspberries and just simmered the sauce a bit longer. It seemed really running but thickened up no problem after baking and cooling. I saw this on your youtube channel and had to make it right away! Thanks for the recipe! Can I sub dates for maple syrup to make it refined sugar free? Oh wow, these look great! I definitely want to try baking with blueberries again. My sisters and I love baking banana blueberry muffins all the time, but I want to whip up a new treat soon. 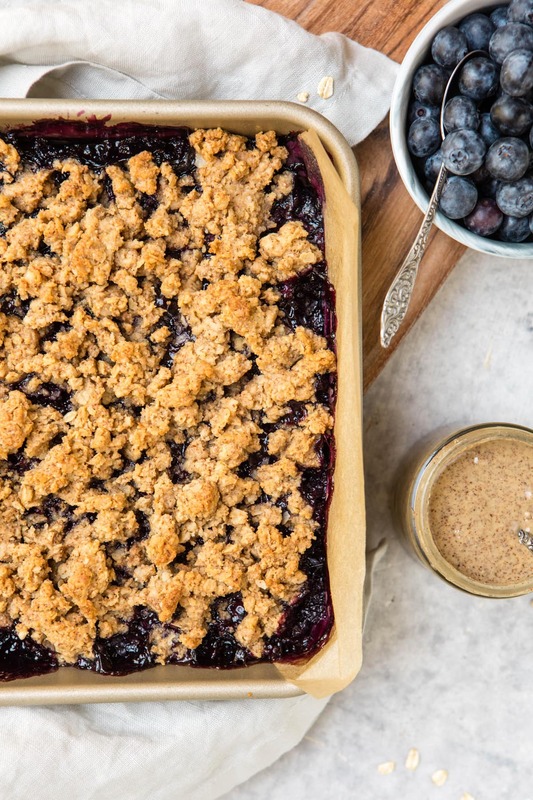 This crumble recipe looks so splendid and too easy! Hi Felicia! I recommend lining the pan with parchment paper instead of greasing it – that way it is very easy to remove the bars. Hi can you sub arrowroot powder for the tapioca?